I just came across this on Boing Boing and had to post it here. That's right. Don't look at the cameras. If you see someone looking at the cameras, report them to the police. This is one of the two new ads for an "anti-terrorist awareness campaign" in London. You know, the city where George Orwell wrote Nineteen Eighty-Four. All I can say is holy crap. A few months ago ACLU partner organization Privacy International released a ranking of the world's worst surveillance societies. England was among the worst offenders, an "endemic surveillance society" along with Russia, China, Singapore, and Malaysia. Oh yeah, and also the United States. Exactly four months ago today New York City switched on the Lower Manhattan Security Initiative, based on London's "Ring of Steel" surveillance network. Wave one features 156 cameras, but the plan is to eventually expand to three thousand cameras, according to New York police commissioner Raymond Kelly. The ACLU has published a white paper summarizing comprehensive research that demonstrates video surveillance does nothing to improve crime. On Wednesday Pennsylvania came one step closer to providing basic protection against discrimination to its gay, lesbian, bisexual, and transgender citizens. HB 300, which would amend the PA Human Relations Act to include “sexual orientation” and “gender identity or expression,” came before the PA House State Government Committee and, by a narrow margin of 12-11, was reported out. The bill must still go before the House Appropriations Committee and then to a full vote before becoming law. Read the Patriot News’ account of the vote here. With anti-equality forces working hard to defeat this bill, we need all fair-minded Pennsylvanians to let their representatives in Harrisburg know that the time has come (in fact, it came and went years ago) to pass this legislation. The Value All Families Coalition – of which the ACLU is a member – will be holding a lobby day and rally this coming Tuesday, March 17th. Lunch and free bus transportation from Philadelphia and Pittsburgh will be provided. For more information, click here. Join us and raise your voice in support of equality for all! HB 300 Passed Out of Committee! Why do we need HB 300? Think this is illegal? You’re not alone. Many people assume that overt discrimination like this, whether it be directed at minority races, women, or LGBT individuals, is against the law. The fact is, however, that it is perfectly legal most places in Pennsylvania to discriminate against someone on the basis of sexual orientation or gender identity or expression. Gender expression, for those who might need a refresher, refers to aspects of a person’s appearance and behavior that identify him or her as a him or her. It is gestures, mannerisms, dress, way of speaking, interests and hobbies, grooming methods, and many other things that are culturally perceived as either “masculine” or “feminine.” Clearly, these gender markers are culturally defined. For example, wearing a skirt is a feminine trait in the United States, while in the Scottish Highlands, no one considers a kilt “girly.” Likewise, a man who wears short shorts, crosses his legs, and orders wine (as opposed to beer or hard liquor) at a bar would likely experience social sanctions in the United States for his “feminine” behavior, but these would be perfectly normal masculine behaviors in Western Europe. 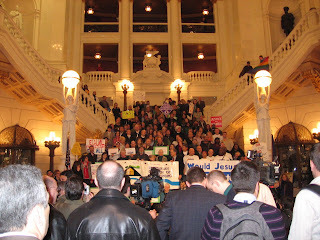 Today members of the Pennsylvania House of Representatives, recognizing the inappropriateness of allowing this sort of discrimination to go on in the United States of America – a country that professes to be the land of opportunity, equality under the law, all men are created equal (where the women are in that one is a topic for another time) – introduced a bill to amend the PA Human Relations Act to include sexual orientation and gender identity or expression. This bill would take the existing law (which prohibits discrimination in employment, housing, and public accommodation on the basis of race, color, religion, ancestry, age, national origin, handicap or disability, education, or the use of a guide dog), and simply add sexual orientation and gender identity or expression to the list. It’s high time that we correct this deficiency in the Act. Certainly it is necessary to bring Pennsylvania law in line with the promises of the U.S. Constitution and the principles of freedom and equality this country was founded on, but more than that…it’s the only fair thing to do.